So, apparently I have been living in the clouds this week- dreaming of basking in the sun, of classic enduring style, and just general living in my head. Am I alone here? As a child and teen, I loved to "read" catalogs (random pet peeve sidebar- I HATE when people refer to catalogs as magazines, ugh). I would imagine myself in that world, with a house filled with that bedroom, and me lounging about here and there looking as polished and camera ready as the models. In between my vitamin D-deficit induced beach lust, I have also had HOUSES on the brain in a bad way the last couple of weeks. I've mentioned before that Hubs and I would love to build on a lot we are in possession of, but construction is expensive. Which means patience, waiting while we save. Patience is NOT one of my virtues. I want a house, I want a dog, someday in the (far) future I want babies, instead of being content in the wonderful place I am now (Erin wrote a wonderful post about this recently- please read). 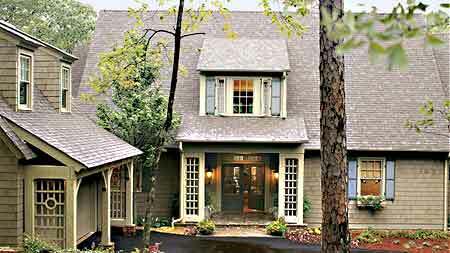 Anyway, here's one of the houses I want to build (all via Southern Living house plans). Of course being as picky particular as I am, there are major modifications I would make. For instance, I would turn the "open to below" area upstairs into some sort of playroom, because I do not like cathedral ceilings in small home. Please do not be offended if you have one and e-mail me. Personal preference, and I'm really weirdly particular as stated previously. I would like to add a couple more shed dormers to the roof, and maybe change the side screened porch to a reading nook/office area. I love to spend time looking at house plans, and at local real estate listings. It's partially because I just love houses and design, but also I am playing a grown up version of my catalog game. How would I renovate that 60's style rancher? Ooh, could I add shingles and paint that yucky brick and that house would be cute? Maybe I could paint that old pine dark pine panelling? What would I do to that down-on-its-luck cottage? If I built this house, what would my kitchen look like? How would I decorate? Could I plant a garden that I could look out on while I washed dishes? Would there be a place for my wall of bookcases that I need? Where would I put my furniture? Where would Hubs Junior sleep? Yeah, sometimes I need to get out of my head just a little bit. Labels: childhood, design, Dreams, Home, I'm glad I'm not the only one, me? I think it's totally natural to be real estate dreaming at this stage of the game. Babies are great and on the someday list, but ooh, a house could be RIGHT NOW! I'm in your boat, too - take a gander at DC real estate and have fun picking your jaw off the floor. This is why it's good I love renovation projects and doing the dirty work myself, because there ain't no way we can scoop up anything else! ps: How amazing you have land, though. LAND! We have... a toolbox for future home renovating?! I love Southern Living houseplans and that one is a beauty! Gorgeous house! I've been picking up real estate (and even apartment) magazines to look at floorplans and pictures since I was all of...10? This house doesn't have enough bedrooms for all of my babies! I think I will need at least 5, since I want 3-4 kids and a guest room is a must. That's not too much to ask, right ;)? I also want a kitchen that is open to a den of some sort, or at least has enough wide open space for both a breakfast area and a couch :) I've seen it done in magazines and I just looove it. I adore that! And I totally agree about cathedral ceilings in a smaller home. It's so much wasted space! This is a great plan, but it could use another room (or two). We will always need to have a guest room since the in-laws are in another state. I'm not sure I would call this home small though. I guess I live in a cottage. Ha! I can totally relate. I often think about my dream house, especially before going to bed each night.